The historical thriller The Imitation Game is precisely the type of film studios love to dangle as Oscar bait. It focuses on a relatively unknown, yet significant, World War II code-cracking project and features a socially awkward genius as its protagonist. It doesn’t hurt that the aforementioned hero and his compatriots are Brits. The film’s distributor, The Weinstein Company, scored at the 2011 Academy Awards with the similarly themed The King’s Speech, so odds are in The Imitation Game’s favor that it will stand among this season’s contenders—despite the plot’s flaws. Noted mathematician and cryptanalyst Alan Turing is often considered the father of modern computer science, but his most consequential work—conducted as a WWII codebreaker—remained largely unknown until the British government declassified related documents in the 1970s. 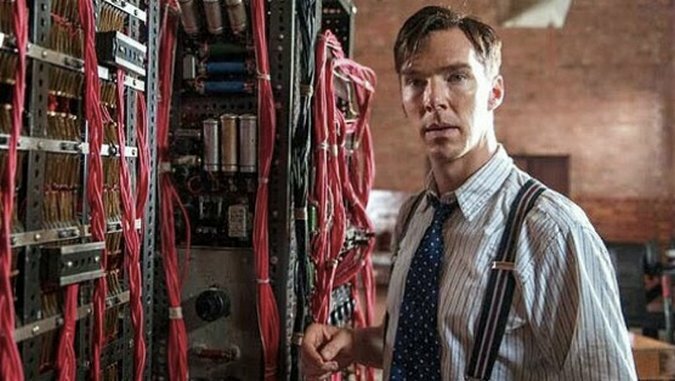 The Imitation Game, with Benedict Cumberbatch as the eccentric Turing, focuses on his wartime tenure at the Government Code and Cypher School in Bletchley Park, located about 50 miles northwest of London. In the confines of the nondescript Quonset Hut 8, Turing leads a team of prototype hackers to decipher Germany’s Enigma machine codes. Their work is said to have shortened the length of the war by several years. Cumberbatch gives an intense performance as the brilliant loner with behavior that registers along the autism spectrum. While he indulges in too much scenery chewing and stammering, Cumberbatch creates a memorable character who is at once fascinating and off-putting. Turing naturally clashes with the group’s more charismatic analyst and man-about-town Hugh Alexander (Matthew Goode), which leaves Scottish mathematician John Cairncross (Allen Leech) and Oxford student Peter Hilton (Matthew Beard) caught in the middle. Also unsurprising is Commander Denniston’s (Charles Dance) instant dislike of Turing and his methods; the head of Bletchley Park spends most of the film trying to fire the cryptologist or pull his research funding. The only person squarely on Turing’s side is Joan Clarke (Keira Knightley), an astute mathematician recruited for the testosterone-heavy team. Knightley shows off a dynamic range as she plays a dutiful daughter, torn between obligations to her parents and her country. She can’t live with or work alongside the men, so Turing arranges for her to reside with the women in the administrative pool and sneaks her bits of Enigma code to work on from home—an arrestable offense. While Clarke strives to please her parents, she also has a spunky independent streak. She thumbs her nose at societal norms and doesn’t call off her engagement to Turing, even when he reveals that he’s gay. Norwegian director Morten Tyldum, known best for 2011’s Headhunters, and scribe Graham Moore keep the tension high, even when the hackers and decoders are conducting tedious work. The supporting actors transcend their one-note characters and capture the audience’s attention. And when Turing’s machine is finally completed and turned on to speed computations, there’s a palpable awe as the Hut 8 team watches history unfold. Once the team cracks the Enigma code, there’s an emergent moral dilemma that’s only briefly addressed. They now have the power to decide who lives and who dies, and the examination of this King Solomon’s quandary would make for far more interesting fare. It’s a missed opportunity—Tyldum instead focuses on the conventional conflicts among the colleagues, the commander and the outcast genius. The Imitation Game is bookended by scenes from Turing’s anonymous post-war life. The police are called to investigate a burglary at the professor’s house, which leads to Turing’s arrest for “gross indecency” for homosexual activity. These scenes, as well as flashbacks to his formative school years and his deep friendship with a fellow male student, are distracting. Such milestone moments are treated perfunctorily, and most of his traumatic experiences happen off screen. Turing’s subsequent death, presumably suicide, is treated as a text epilogue, as is a posthumous formal apology from the British government. Tyldum’s film offers a simple rendering of a complicated project and an even more complex man. While it illuminates the contributions of Alan Turing to the war effort and to modern computer science, The Imitation Game fails to examine more difficult and thought-provoking themes, the least of which is the persecution of a British national hero for his sexual orientation.